This week brings another guest blog from the wonderful Debbie, Feline Behaviour Advisor at Blackwater Valley Vets. So very often older cats are sadly overlooked by people wanting to adopt from Rescue Centres but these cats can give their new owners so very much. Older felines are not such hard work as young kittens and young adult cats can be. As we reach a certain age we often don’t want to take on a kitten or young cat as they could outlive us and depending on your family situation this could cause concern in later years. 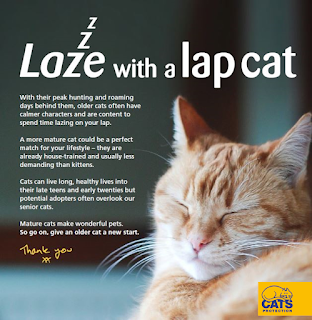 Older cats are more content to sleep more and will often seek out the comfort of a warm lap or sit close by you on the sofa. Aloof cats can become more affectionate as they age. 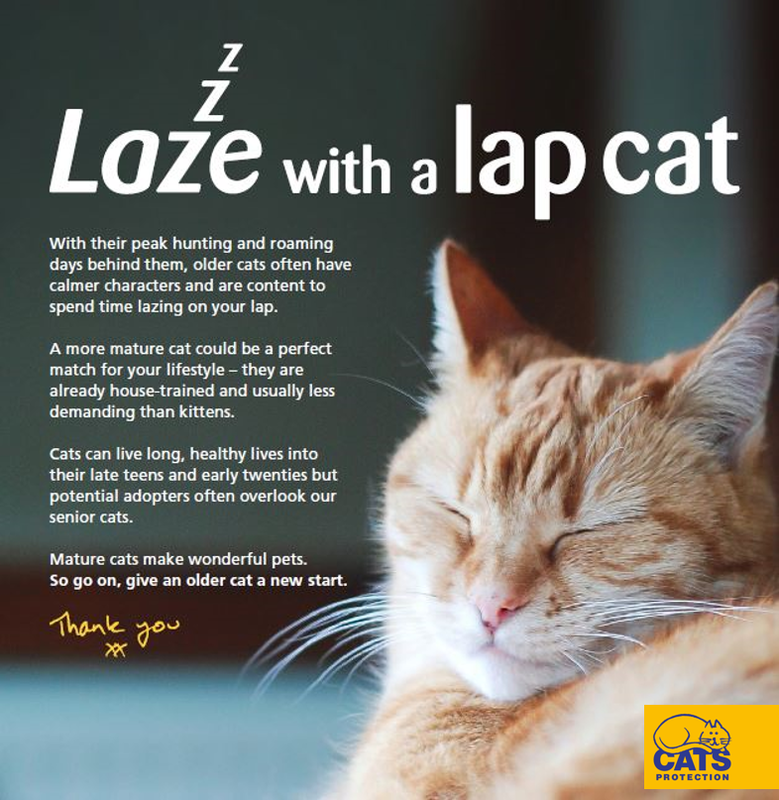 Older felines often feel more vulnerable in their outside territory especially if younger and more confident cats are in the local vicinity so would prefer to accompany their owners outside or potter about rather than venturing further away from their garden. Obviously taking on an older cat will need a lot of thought and careful consideration especially financially as when they age they are more susceptible to age related conditions. Once a cat reaches 12 years of age it is the equivalent to us being 70. Signs to look out for with an older puss is a loss of appetite, drinking more, mobility issues, bad breath, weight loss, constipation or passing urine more frequently. If you notice any of these signs take your cat to the Vet for a senior health check, as generally if conditions are caught early enough they can be treated. Cats at any age are masters of disguise when it comes to pain or discomfort so clues for this include sleeping more, obviously more difficult to pinpoint with an older cat as they would naturally sleep more anyway. Out of character grumpiness or aggression can also indicate pain that the cat may be is experiencing. Also observe any unusual sleeping positions as tummy or abdomen pain can be associated with these as the cat finds it tricky to get comfortable. A few main age related conditions that can affect the older cat are Renal Disease, Hyperthyroidism, Arthritis, Diabetes, Cystitis and Constipation. Consider your older cat when making any changes however insignificant to ourselves, to the inside of your home as your cat will find them more challenging even if new furniture or carpets arrive as these will bring strange smells into your cat’s core territory. Just as we would look at the layout of our homes when we age and get stiffer it is no different for our cats and any helpful tweaks to their inside and outside territories to help them cope more will be much appreciated by them. Placing a few water bowls around the home away from their food bowls will encourage your cat to drink as in the wild cats are reluctant to drink near to where they catch prey in case the water is contaminated. Older cats can suffer with urinary tract problems or Cystitis so drinking is important for them. Some cats like mine prefer filtered water; others bottled water and a lot like the water fountains that cascade a continual stream of running water. I have found that placing a bowl at the top and bottom of my stairs and one in the utility room has helped my cats and they drink from all three. If your cat’s feeding station is elevated then placing a chair or making a few steps to help them climb up can help with any mobility issues. Placing the food bowl on a brick to higher it up to avoid any extra strain on their necks can be useful. You can buy elevated bowls to help with feeding from larger pet stores and on line. Tips to help with a cat that seems disinterested in food are to gently warm the food up in a microwave for a second to blood temperature as this increases the aroma as older cats often lose some sense of smell. Adding a little water to make the food more of a pate consistency can also help. Adding the liquid from a low sodium, low protein source like tuna spring water not brine or low salt chicken broth can increase palatability and encourage eating. It is a good idea to get your older cat’s teeth and gums checked by your Vet if they go off their food as this can often indicate dental problems. Bad breath is often another common indicator of gum or dental issues. A brick or step placed either side of the cat flap can help your cat enter and exit more easily and a bolt hole located near to the exit of the cat flap will allow an older more insecure cat enter their outside patch more securely as they can survey from here before entering further. I have found that a garden bench or the barbeque has worked well for me. Looking at the garden from your cat’s view point can be useful especially in the older cat’s case. Densely stocked flowerbeds with shrubs and bushes of varying heights will provide more private surveying areas. A private and un overlooked latrine site will be welcome as older cats feel more vulnerable eliminating outside. A safe spot reserved for sun bathing in the warmer months will be welcome too. Arthritic and stiff jointed cats will benefit from a soft fleece placed on their favourite resting place and I have bought a heat reflective fleece for my cat’s basket. You can also warm up a heat pad and place this under a fleece or blanket for them. The damper and colder weather can really affect the older cat’s joints and mobility. There are joint supplements you can give your cat or sprinkle onto their food but please be careful and take advice from your Vet before using them as some supplements are not what they appear to be and the contents may not necessarily be inside. The International Centre for Nutritional Excellence has a handy website icne.co.uk who can give you proper information on joint supplements to help you, or speak to your Vet for their recommendations. Providing a couple of litter trays with some soft grained litter in as this is softer under paw, please try to avoid pellets as these can be hard on an older cat’s paw pads as they will be more sensitive due to not going outside as much. Fill with a minimum depth of 3cm as your cat needs to dig and place the trays in quiet, private corners avoiding main thoroughfares and not near to windows, glass front door panels or cat flaps. I have placed one tray on the upstairs landing and one in the utility room and both are used. In my view providing a litter tray for an older cat is a must and it gives them a choice especially if the weather is cold, icy or damp outside. Even older felines can still enjoy a gentle game and little 10 minute play sessions can help keep them mentally stimulated. Fishing rod style toys encourage their predatory skills and popular options are inexpensive ones like rolled up pieces of paper or tinfoil or ping pong balls. Try to keep an eye on your cat’s nails as they may need regular clipping to avoid them getting caught in your bedding or carpets. Curled round nails can be painful as they dig into the sensitive paw pads. Our Veterinary Nurses can perform nail clips to help you if needed and can teach you do this task at home. Older cats often prefer to spend most of their time indoors especially in the colder months so they will not wear their claws down as much. Providing a scratching post will help with this and cats will want to strop, scratch and stretch their muscles when they wake up. would be hard for your cat to reach can help with the coat appearance. Gently grooming with a baby brush or other soft brush can help to get rid of loose top hair. Regular flea treatments with a product that actually works will also be beneficial for the older cat. Don’t be too alarmed if your older cat especially the more senior they become starts to vocalise more, especially at night. This is quite normal and part of the ageing process. Some cats can become disorientated or distressed if they are not within sight of their owner, some will wail and stare at blank walls. Senior cats can suffer with a form of feline dementia. What helped me in the past with my 17 year old cat who was unable to get up on my bed and cried a lot, was to make a warm bed for him out of a cardboard box, I laid it on its side and cut a wide gap in the front for access. I lined it with a towel, a fleece with a heat pad wrapped in it and then put my soft dressing gown on top, and my scent was stronger on this garment and acted as a comforter. He seemed to settle better with this. You may want to consider a product called Feliway which can be helpful with our older felines. A cat will rub their cheeks against objects indoors and outside or us owners to leave behind substances called facial pheromones which convey a message of security and reassurance. Pheromones are chemical substances used for communication between members of the same species. Feliway has been formulated to contain a synthetic fraction of this facial pheromone and comes in a plug in diffuser or a spray both of which can be used in conjunction with each other if needed. It is scent free to us and is safe to use around babies, children and dogs. The diffuser lasts a month with refills available and the spray comes in handy for vet and cattery visits or to use on the cat’s bedding or around the cat flap area. I have plugged in a Feliway diffuser in my bedroom to help my older cat cope better at night. Have a look at my autumn feline tips on our Blackwater Valley Vets Facebook page as we are offering a discount on any of the Feliway range until the end of the year. Well I really hope that these tips have helped a little and that you have enjoyed my article on older cats. My final advice and something I have followed long before I worked for a Veterinary Practice is to have my older cats annually blood tested from the age of 12. Early, chronic or acute age related diseases can be detected and the earlier diagnosed the easier it is to treat. Finally, enjoy the charm and companionship of your older cat and long may your special relationship together continue.